Corporate insiders know a lot of valuable secrets about publicly traded companies. Technically, insider trading laws state that they’re not supposed to use their access to insider information to enrich themselves in the stock market. But they do. And as long as they promptly file a disclosure after each transaction, it’s legal. 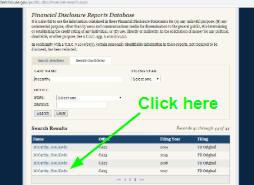 A couple weeks ago, I taught you how to use EDGAR to look up these disclosures — and how to incorporate them into your due diligence process. Today, I’m going to teach you how to profit from the publicly disclosed trades of an even more powerful group of insiders: your elected representatives. How Is Congressional Insider Trading Legal? 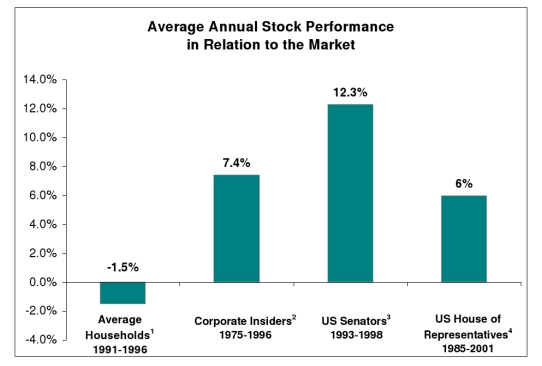 As you can see from the chart below, members of Congress have historically done very well in the stock market compared to lowly commoners like us. Representatives have done almost as well as corporate insiders, and senators have done even better. It’s easy to understand why members of Congress would have an advantage in the stock market. They’re privy to all sorts of sensitive information: economic data, geopolitical news, upcoming changes to regulations and tax policy, etc. It’s less easy to understand why it’s legal for them to trade on this information. Actually, no it isn’t. They’re Congress. They decide what is and isn’t legal. President Obama attempted to crack down on the widespread practice of congressional insider trading with the 2012 Stop Trading on Congressional Knowledge (STOCK) Act. 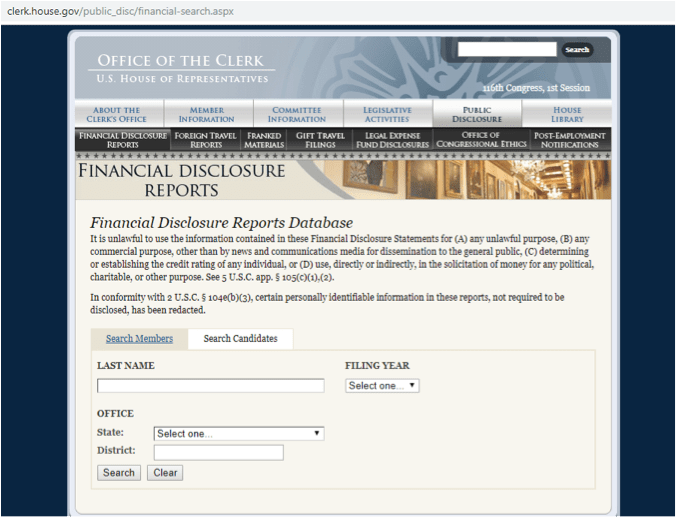 The law instituted strict online financial disclosure requirements for elected representatives and their staff. And it worked… sorta. For a little while. From 2011 to 2012, the number of stock transactions made by Congress fell by more than half, as they all had to disclose their transactions in a searchable online database. But then in 2013, Congress neutered the law in a quick procedural vote by greatly loosening the online disclosure requirement. 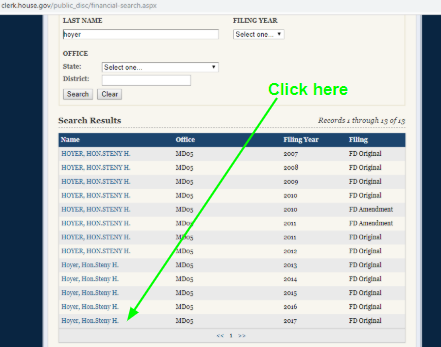 Type the last name of the representative you want to search into the “Last Name” field, and then click “Search.” You don’t need to fill out the “State,” “District,” or “Filing Year” fields, although they may be helpful in refining search results if your representative has a common last name. 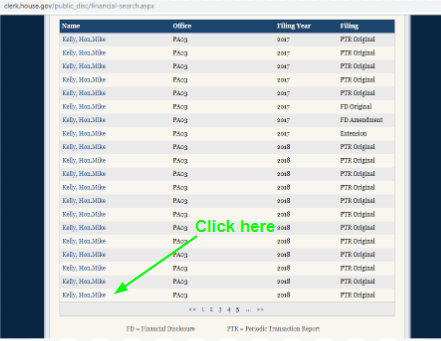 Go to the bottom of the last page of search results and click on the latest filing marked “FD” (Financial Disclosure) or “PTR” (Periodic Transaction Report). Both contain information on your representative’s recent transactions. Scroll down to “Schedule B: Transactions.” It’s usually on the second page. Here, you’ll find a complete list of all the securities that Rep. McCarthy bought in 2017. A “Tx. Type” of “P” indicates a purchase, an “S” indicates a sale, and an “E” indicates an exchange. 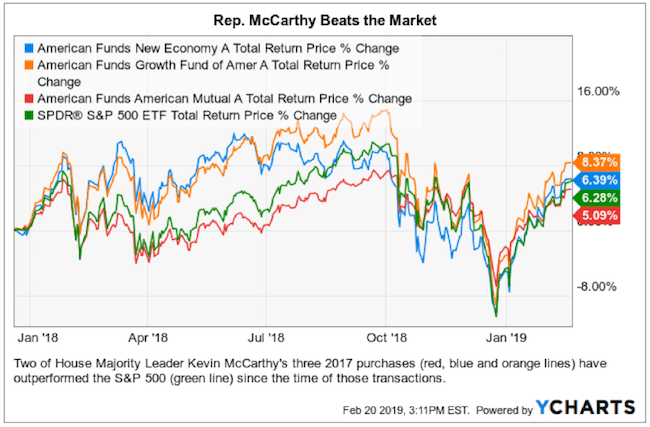 As you can see above, Rep. McCarthy bought three domestic-focused growth funds right around when the Tax Cuts and Jobs Act was passed in late 2017. And sure enough, two of them have outperformed the S&P 500 since that time. We’ll talk more in a moment about what to do with this information. First, for the sake of completeness, let’s go over how to read the other type of filing. PTRs are a bit trickier to read because they are handwritten and in landscape format. Your PDF viewing program (even if it’s just your browser) probably has a way to rotate these kinds of documents so you don’t have to crane your neck to read them. 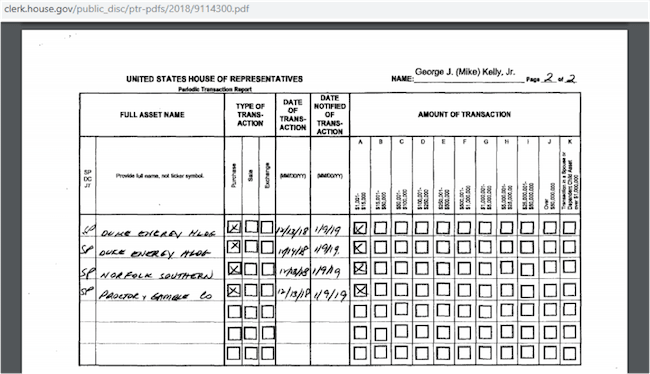 As you can see below, Rep. Kelly bought some shares of Duke Energy (NYSE: DUK), Norfolk Southern Corp. (NYSE: NSC), and Procter & Gamble (NYSE: PG) in December 2018. But how useful is this information to the average investor, really? The answer is quite useful — as long as you have realistic expectations about how to use it. First, let’s go over how not to use this information. If you try to day trade on your representative’s transaction reports, you’re gonna have a bad time. Congress isn’t exactly known for its speed and efficiency; these reports are often filed and posted in arrears. 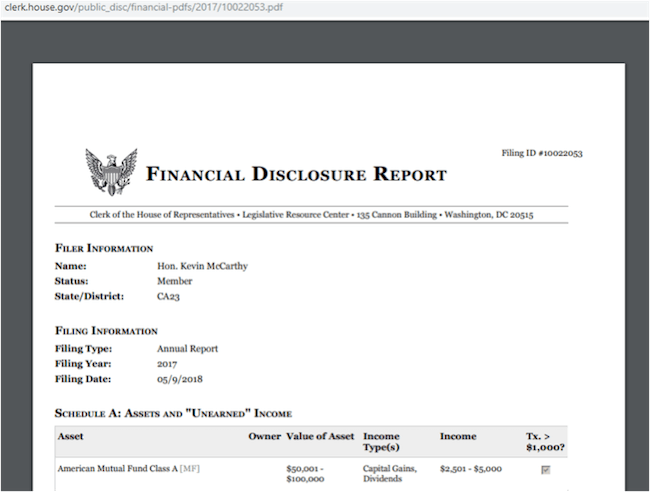 The disclosure from Rep. McCarthy, for example, was a 2017 FD that wasn’t posted online until the summer of 2018. So it won’t give you a short-term trading advantage. 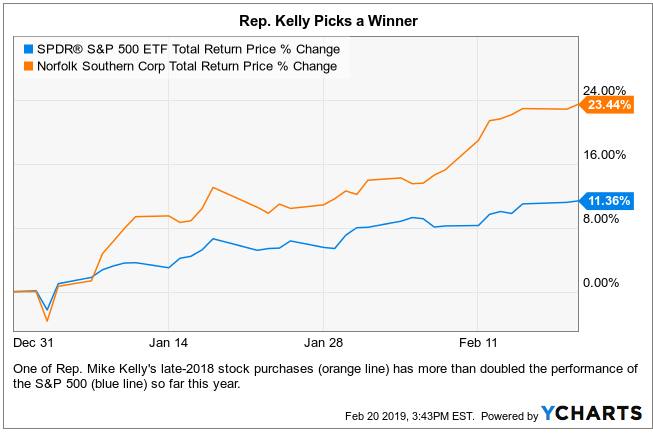 On the other hand, if you’re rebalancing your 401(k) or IRA and trying to decide which mutual funds to bulk up on this year, recent congressional purchases might give you some useful inspiration. Especially if the representative in question is a member of the party that controls the House. As we saw above, Rep. McCarthy bought a bunch of U.S.-focused growth funds right when the then-Republican House passed the Trump tax cuts. Indeed, domestic growth stocks were big beneficiaries of that tax cut, and they’ve done very well since then. With this in mind, you might want to keep an eye on stock purchases by Democratic representatives in the months ahead. They now control the House. The party’s latest agenda item, the Green New Deal, spearheaded by Rep. Alexandria Ocasio-Cortez (D, New York), could bring major changes to our economy if it’s implemented. And it could funnel a lot of money into renewable energy investments. Energy and Capital editor Luke Burgess recently wrote about it here. No matter what craziness comes out of Washington next, you now know how to see which members of Congress are profiting from it.